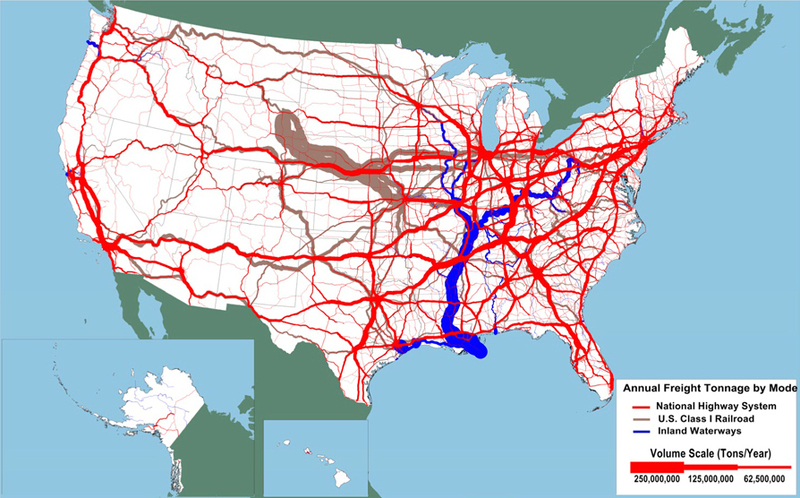 This map indicates the amount of freight moved across portions of the United States via different modes of transportation in 2007. Data sources for the map are as follows: Highways: U.S. Department of Transportation, Federal Highway Administration, Freight Analysis Framework, Version 3.4, 2012. Rail: Based on Surface Transportation Board, Annual Carload Waybill Sample and rail freight flow assignments done by Oak Ridge National Laboratory. Inland Waterways: U.S. Army Corps of Engineers (USAGE), Annual Vessel Operating Activity and Lock Performance Monitoring System data, as processed for USAGE by the Tennessee Valley Authority; and USAGE, Institute for Water Resources, Waterborne Foreign Trade Data, Water flow assignments done by Oak Ridge National Laboratory.